This course was published in the January 2017 issue and expires 01/31/2020.The authors have no commercial conflicts of interest to disclose.This 2 credit self-study activity is electronically mediated. Explain the origin of CAD/CAM dentistry and how this technology is used in restorative procedures. List the advantages of digital impressions in clinical practice. Discuss potential uses for these forms of digital dentistry, and the percentage of U.S. practices that use CAD/CAM systems. Describe the benefits of implementing CAD/CAM technology into practice. In addition, adopting digital impression technology can increase case acceptance by providing on-screen images that can be discussed in treatment presentations. The ability to magnify scanned dentition can also aid diagnoses and help ensure more accurate impressions, which, together with the accuracy of CAD/CAM fabrication, can contribute to better-fitting restorations and more predictable outcomes. 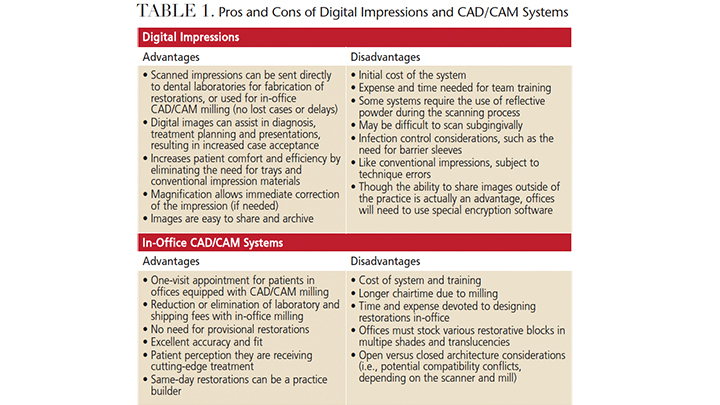 Most oral health professionals believe new technology helps advance dentistry and quality of care for patients.7 Table 1 lists some advantages and disadvantages of digital impressions and chairside CAD/CAM systems. Data acquired during digital impression scanning is sent to dental laboratories for fabrication of restorations, or, if properly equipped, the dental team can use chairside CAD/CAM systems to design and mill restorations in the office. This allows indirect restorations to be prescribed and placed in one visit. While not the subject of this article, 3D printing represents an additional advance in CAD/CAM dentistry. Unlike milling, 3D printing is an additive process in which successive layers of material are used to create physical models. Currently, 3D printing is limited to polymers and does not include ceramics.10 Examples of 3D printing include crown and bridge models, orthodontic models, bite appliances and surgical guides for implants. Research demonstrates the accuracy of digital scans is at least comparable to conventional impression methods.13 In practices equipped with in-office design and milling systems, advantages for patients include one-appointment dentistry that eliminates the need for provisional restorations. 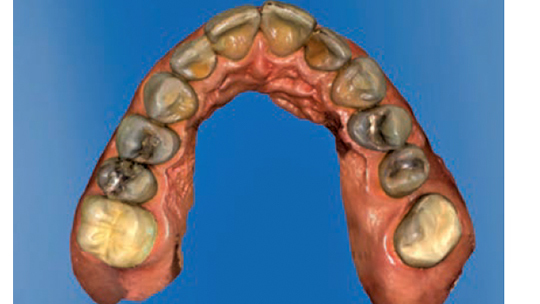 Digital impressions may also be more comfortable for patients because they sidestep the need for trays and conventional impression material, such as polyvinyl siloxane. Whether the restoration is fabricated by a lab or via in-office milling, the patient also benefits from the availability of biocompatible and highly esthetic ceramic materials that allow long lasting, minimally invasive restorations. Digital impressions offer the benefits of magnification and facilitate visualization of precise detail that allows for immediate corrections (if needed). Scanned impressions also eliminate common shortfalls of traditional impression techniques, including material shrinkage, pulls and bubbles, and expansion of die stone. In addition, there are no cumbersome physical models to store or disinfect. Digital impressions can be saved electronically and permanently, without consuming physical laboratory or office space. Imaging and retakes are quick, easy, and — system costs aside — less costly than traditional impressions. Margin integrity is another example of why CAD/CAM technology has been widely accepted in restorative dentistry, as this and internal fit of fixed prostheses rank among the most crucial criteria in determining clinical success. Poor margin integrity can cause plaque accumulation, leading to periodontal breakdown, recurrent decay and, ultimately, failure of the restoration.14 There are varying opinions regarding acceptable margin gap for crowns. In general, margin gaps of 100 micrometers or less are clinically acceptable.14 A study evaluating two CAD/CAM systems found that both produced superior margin fit values, and that margin adaption for both systems was within acceptable ranges.14 In addition, a systematic review by Boitelle at al15 evaluated the fit, precision and accuracy of CAD/CAM restorations. The findings indicate it is possible to create a milled restoration having a teeth/prosthesis gap less than 80 micrometers. The review also shows these systems improve the average prosthesis’ adaptation compared to conventional manufacturing methods. Implementing digital technology into practice — including the use of intraoral cameras and digital impression scanners — can enhance the dental and dental hygiene process of care.16,17 During the examination, the clinician systematically gathers subjective and objective information related to the patient’s oral health status. The use of these imaging technologies can aid in the detection and diagnosis of dental disease by providing a magnified, high-resolution image that can be shared digitally between team members, or during referrals. Utilization of a scanner or intraoral camera allows the clinician to document patient hard tissue data and digitally record clinical findings (Figure 1). Images can be used to visually demonstrate oral health issues that later will provide a foundation for the diagnosis and treatment plan. For example, some systems record high-definition video images that can be used not only for digital impressions, but also for 3D imaging. Nonstatic imaging is fast, clear and easy. Patients can be shown images of fractured teeth, deteriorating restorations, calculus and gingival inflammation. The patient-centered care plan is assisted by precise imaging and the opportunity for enhanced patient education. Treatment plans can be tailored to the patient’s priorities, goals, interventions and expected outcomes. Digital acquisition units using 3D imaging enable clinicians to show patients oral health conditions in a much more effective and dramatic way than simple verbalization of dental findings (Figure 2). 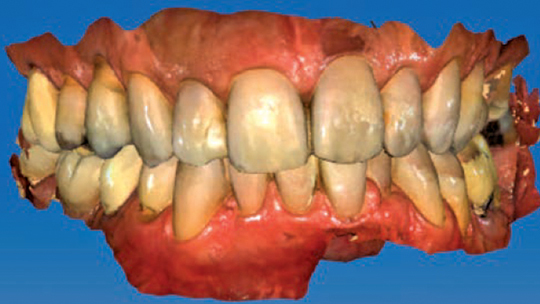 Communicating the long-term benefits of restoration longevity, esthetic quality and increased patient comfort achievable with various restorative technologies encourages informed decision-making by the patient. In practices that offer amalgam, composite and milled restorations, it is important for all team members to be comfortable discussing the advantages and options for each type. Knowledgeable clinicians, for example, can describe how CAD/CAM restorations can help retain maximum tooth structure, and why this is important to the strength of the tooth. In practices equipped with in-office CAD/CAM fabrication capability, advantages include one-visit restorations, eliminating the need for provisionals, a highly custom fit, and an esthetically pleasing outcome. FIGURE 2. Digital scan of an anterior bitewing. In addition, oral health slideshows depicting before-and-after digital images of restorative procedures and periodontal therapy demonstrate potential positive outcomes of proposed treatment. This technology allows clinicians to take patients on a tour of the oral cavity while providing scenarios and options for optimal care. As a result, it facilitates a more personalized approach to help patients better understand their oral conditions and guide them toward greater responsibility for their oral health. Clinicians can use these digital technologies to image planned restorative treatment, answer patient questions, reinforce comprehensive care plans, and discuss maintenance and treatment options for the patient’s individual conditions. The speed and convenience of digital imaging enhances clinical efficiency, as the entire process takes minutes. For example, having preoperative images or impression scans from the dental hygiene visit could save the dentist time during the restorative phase of the treatment plan, at which point the dentition can easily be reimaged (as needed) before the dentist preps the tooth (Figure 3). FIGURE 3. Digital scan of a crown preparation. Another example would be a dental hygienist or assistant who images a full arch for the purpose of night guard fabrication. In this scenario, both the patient and dentist benefit from reduced time and appointment commitment needed for fabrication, fitting and delivery of the appliance. Additionally, the patient is already involved in the decision- making process and ongoing maintenance discussions, thus promoting a vested interest in treatment outcomes and success. Most practice management professionals would agree that cross-training the dental team in the use of digital imaging/impressions and CAD/CAM technology is invaluable to improved efficiency and cohesive care. Clinicians who are knowledgeable about digital imaging and restoration design and delivery will add value to the practice. Oral health professionals can apply these technologies for educational and diagnostic purposes, while simultaneously increasing case acceptance and enhancing productivity during the restorative phase of treatment. Ultimately, the dental team’s ability to image, design and mill restorations may increase practice productivity. Dental health care delivery exists in a digital world that is continually evolving as technology — and the innovative transformation of patient care — advances. Implementing cutting-edge technologies, such as digital imaging and CAD/CAM restorations, will enhance the oral health care experience. Reifeis PE, Kirkup ML, Willis LH, Browning WD. Introducing CAD/CAM into a predoctoral dental curriculum: a case study. J Dent Educ. 2014;78:1432–1441. Gadbury-Amyot CC. Technology is a critical game changer to the practice of dental hygiene. J Evid Based Dent Prac. 2014;14(Suppl):240–245. Rhea M, Bettles C. Dental Hygiene at the Crossroads of Change: Environmental Scan 2011–2021. Available at: adha.org/resourcesdocs/ 7117_ADHA_Environmental_Scan. pdf. Accessed December 14, 2016. Hodd JA. CAD/CAM dentistry for today’s on-the-go military. US Army Med Dept J. 2011:26–37. Christensen GJ, Child PL Jr. 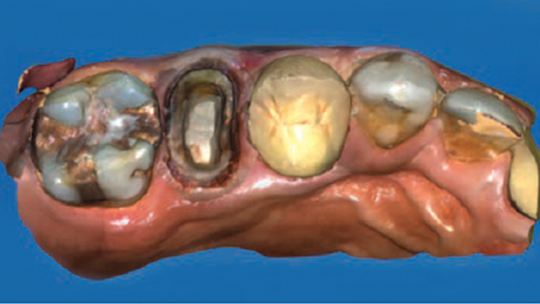 Fixed prosthodontics: Time to change the status quo? Dent Today. 2011;30:66–73. Poticny DJ, Klim J. CAD/CAM in-office technology: innovations after 25 years for predictable, esthetic outcomes. J Am Dent Assoc. 2010;141(Suppl 2):5S–9S. Levin RP. Purchasing new technologies. J Am Dent Assoc. 2010;141:461–462. Hack GD, Bloom IT, Patzelt SB. Digital impressions. In: Masri R, Driscoll C, eds. Clinical Applications of Digital Dental Technology. Danvers, Mass: John Wiley & Sons, Inc; 2015:27–28,39. Masri R, Driscoll C, eds. Clinical Applications of Digital Dental Technology. Danvers, Mass: John Wiley & Sons, Inc; 2015. Alghazzawi TF. Advancements in CAD/CAM technology: options for practical implementation. J Prosthodont Res. 2016;60:72–84. Kumar S, Reynolds R, Williams NJ. The information revolution. Dimensions of Dental Hygiene. 2013;11(6):52–55. Brownstein SA, Murad A, Hunt RJ. Implementation of new technologies in U.S. dental school curricula. J Dent Educ. 2015;79:259–264. Ender A, Mehl A. Full arch scans: conventional versus digital impressions — an in-vitro study. Int J Comput Dent. 2011;14:11–21. Hamza TA, Ezzat HA, El-Hossary MM, Katamish HA, Shokry TE, Rosenstiel SF. Accuracy of ceramic restorations made with two CAD/CAM systems. J Prosthet Dent. 2013;109:83–87. Boitelle P, Mawussi B, Tapie L, Fromentin O. A systematic review of CAD/CAM fit restoration evaluations. J Oral Rehabil. 2014;41:853–874. Wilkens E, Mueller-Joseph L, Wyche C, Homenko D. The professional clinician. In: Wyche CJ, ed. Clinical Practice of the Dental Hygienist. 11th ed. Philadelphia, Pa: Lippincott Williams & Wilkins; 2012. Standards for clinical dental hygiene practice. Available at: adha.org/resourcesdocs/ 2016-Revised-Standards-for-Clinical- Dental-Hygiene-Practice.pdf. Accessed December 14, 2016. From Decisions in Dentistry. January 2017;3(1):54-57. Sharon L. Varlotta, RDH, MS, is a clinical assistant professor at the University of Maryland School of Dentistry in Baltimore, where she shares her appointment at the school in the Department of Endodontics, Prosthodontics and Periodontics, and the Department of Oncology and Diagnostic Sciences. Prior to teaching, Varlotta worked in private practice for 14 years. She can be reached at svarlotta@umaryland.edu. Ira T. Bloom, DDS, is the assistant director of the Advanced Education in General Dentistry Program at the University of Maryland School of Dentistry in Baltimore. He has lectured on CAD/CAM and esthetic dentistry, and recently coauthored a chapter on digital impressions in the textbook Clinical Applications of Digital Dental Technology. Previously, Bloom was in private practice for 35 years, focusing on esthetic, CAD/CAM and restorative dentistry.